Every other year I try to get to the OBX for a week or so to stare at the surf and lose terminal tackle in the ocean. On trips in the early Fall I catch a fish once in a while and on Spring trips I usually catch nothing but skates, dogfish, and game fish that are too small to keep. I think the biggest problem with my Spring efforts is my obvious lack of any fishing talent. I never hike out to the Point at Buxton to combat fish with the crowd at night, but on the incoming tide I can usually be found at one of the access points between Nags Head and Frisco. Anyone else here fish the area? I fish Avon mostly fish the pier unless I get the 12/0 out to target a big toothy. when it comes to fishing the box its mostly what do you want to catch? reds, trout, cobra, kings? they all have different seasons. For catching fish in the surf it is hard for me to beat bluefish. They are not the best eating fish but they are aggressive and can bend a rod just fine. For catching fish to eat I like pompano and of course flounder. On the rare times I have found the pompano they are very close to shore nearly at my feet eating soft shell sand fleas. The occasional drum is also welcomed. Fishing the piers is a relaxing way to spend the day unless a gang of guys claim a whole section (usually the end) and get belligerent with anyone that dares set foot in it. I have seen guys actually threaten (they seemed serious about it) to throw and older couple off the side of the pier when they walked through. I used to fish the old wooden pier at Frisco quite a bit, and have had a bit of fun at Nags Head and Avon too. Even if I do not catch much the local barbeque makes the trip worth it! depending on when you go the Spanish mackerel run can be intense! to say the least, my last trip to Avon we put over 100 Spanish on the deck between 8 anglers, up to 6 1/2 pounds, in 2 hours. and they are very good to eat. I mainly live bait fish for cobia, the best eating fish from the ocean as far as I'm concerned. The gang at the end of Avon pier is the best bunch of guys I ever been around. I've made lifelong friends there on the planks. pomps are always in the wash when they are there, the whiting are not far behind, throw a sting silver or gotcha beyond the breakers for Spanish. cobia will take a bottom bait but you always risk catching a ray when you put meat on the bottom, but they do put up an awesome fight if you catch a big one. 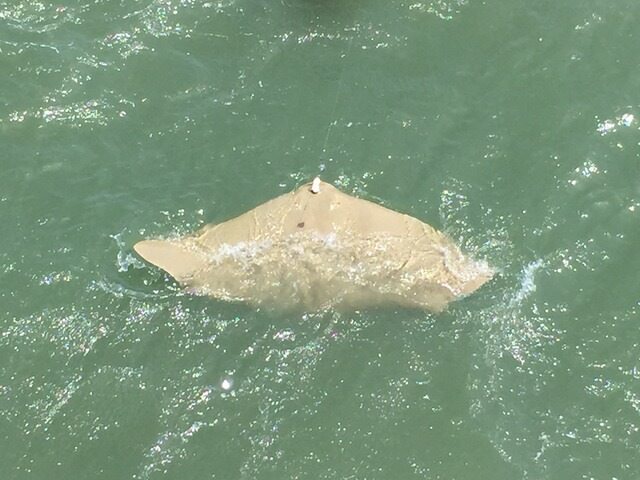 unless you use ray for bait then you may catch a big toothy. Last edited by Ridge Runner; 01-20-2019 at 02:53 PM. A Gotcha from a pier beyond the surf when the Spanish are around is great fun! When you are trying for Cobia with live bait do you use a two pole rig like you would use for Kings? yes, same setup. same bait, just may/June for cobia, July/aug./ sept for kings and tarpon, and always sharks. but cobia will take a bottom bait also, as will a tarpon occasionally. Stayed in south nags head a few years, but Avon, Frisco is 1/2 the price or less. and its a little more geared towards fishing down there. However not as much tourism driven activities there.